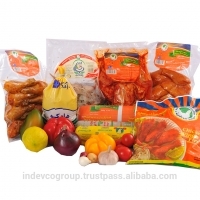 Send a buying inquiry to Vacuum Pouches For Poultry, from Indevco Sal, Lebanon. Product Id 763141. We produce PA/PE co-extruded films used as a top web on thermoforming machines for packing poultry, meat and fish. Our bags: Provide excellent clarity, glossiness & stiffness Ensure premium product appearance & pack shape Have puncture resistance with optimum thickness High oxygen barrier Available in EVOH to increase shelf-life We also manufacture FFS Films, Laminated Films, Laminated Pouches as well as PE Films & Bags This product is produced by INDEVCO Group manufacturing plants.